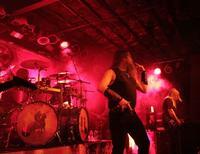 What was billed as “An Evening With Amon Amarth” started the first stop on the tour in Chicago for a sold- out show at the Bottom Lounge. While you might wonder if this is a small venue for such a band like Amon, the answer would be “yes.” With last minute plans to tour the USA, they had a hard time booking larger venues in such short notice, but it did not stop them from giving the fans a big venue feel to their set. With no opening act on the bill, it was an Amon fans’ dream come true - with fans driving from as far away as Iowa to see the show. 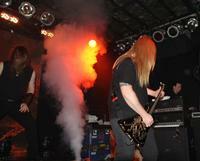 With a small stage to work with for the five Viking gods of metal, this created a very (strange as it sounds for Amon); intimate atmosphere. 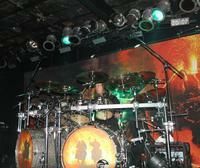 With a backdrop from the new album cover, Surtur Rising and the double bass drum kit of Fredrik Andersson matching. As the packed house waited for the opening set of the complete new album to be played in its entirety, the first track from War of the Gods started as the guys walked on stage to a huge roar of approval. 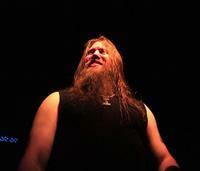 Johan Hegg looked larger than life as he sang in his unique vocal styling. Hegg fits the mold of a Viking to a tee but as the night went on, you could picture having a cold beer with him, because there is no ego at all with him. Several times throughout the night, he told stories and talked about how they made beer just for their band and are selling it at the Bottom Lounge. Both Johan Soderberg and Olavi Mikkonen took turns shredding and creating works of art on their guitars as their hair flayed away with each insane chord change. 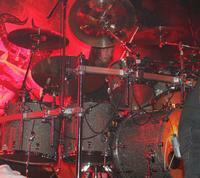 For me, the standout players that night were Ted Lundstrom on bass and Andersson on drums. I’m not sure how Lundstrom did it, but he used every inch of the stage to rip home a huge bass line that had everyone’s heads banging. 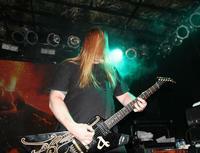 Lundstrom has no “stop” button to him, and I’ve never seen someone non-stop head bang like he did. To go along with the thick bass line was Andersson’s double bass drumming; he looked like Thor up there banging away with his hammers providing a solid wall of thunder. As the hour long first set ended, Hegg reminded the crowd they would be back to finish the night with their greatest hits and close to two hours more of music. As the second set started, they opened with “Twilight of the Thunder God,” which was the start of an amazing set of greatest hits. While the first set was great, particularly hearing a full album played in full, considering the album is so new, it just did not hit as deep as the second set did. I think most of the crowd felt the same as mosh pits tried to form in the tightly packed venue. The onslaught of hits continued with “Masters of War,” “With Odin on Our Side,” “Thousand Years of Oppression,” delivered as a very tight, well-oiled war machine. 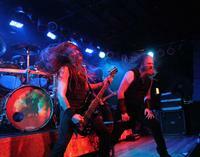 Amon proved why they are so well respected in this genre of music. They ended the second set with a medley of “Victorious March,” “Gods of War Arise” and “Death in Fire.” If that was not enough for the Chicago fans, they came out to do a three song encore to leave the crowd very pleased with their Metal gods. It probably pleased Odin, as well.